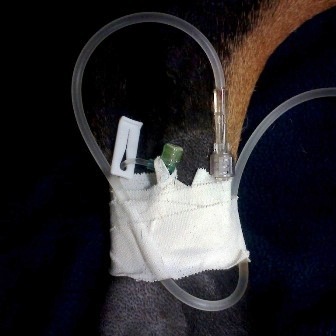 Coby Richter, DVM, DACVS, discusses factors involved with surgical site infections and tips to reduce their occurrence. 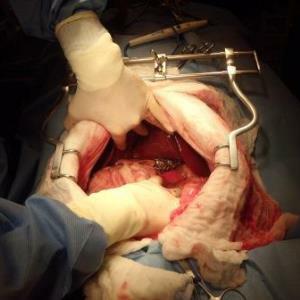 Surgical site infection (SSI) is an important cause of morbidity and mortality in veterinary patients. The Centers for Disease Control and Prevention (CDC) defines SSI as any infection occurring at the surgical site within 30 days of the procedure or within one year if an implant is used. Unfortunately, the incidence of SSI in veterinary patients is not well documented, thus many of the statistics are extrapolated from the human medical field. When evaluated by wound classification, the National Research Council summarized the reported incidence of SSI in the veterinary literature; clean and clean-contaminated procedures have a 2-5 percent risk of infection whereas contaminated and dirty surgeries are reported at 4-12 percent and 6-18 percent respectively. Recognizing SSI risk factors and making a concerted effort to monitor our patients for post-operative infection can have a positive effect on our patients, our clients and our practices. The CDC further subdivides SSI into three categories: superficial, deep and organ/space. Superficial SSIs occur within 30 days and include only the skin and subcutaneous tissues of the incision. Deep SSI occurs within 30 days if no implant or one year of the procedure if an implant was used and includes deep soft tissues of the incision (i.e. facial and muscle layers). Organ/space SSI has the same time definition as deep but includes any part of the body other than the incision that is manipulated during surgery, such as tibial osteomyelitis following TPLO or septic abdomen following ovariohysterectomy. Factors which can contribute to surgical wound infection include host risk factors, surgical wound factors and the virulence and pathogencity of the bacteria involved. With respect to our patients, compromised immune system secondary to diabetes, chronic renal failure, hepatic insufficiency, and neoplasia can increase the risk of infection. 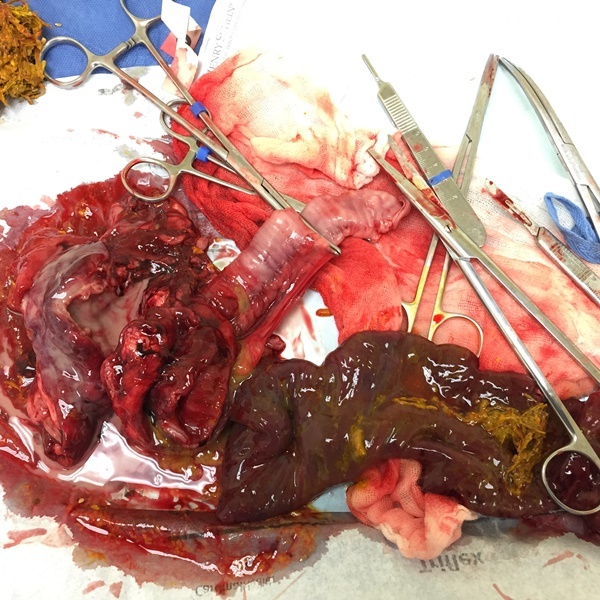 Specifically documented in dogs and cats, endocrinopathies such as hyperadrenocorticism are associated with a dramatically higher risk of infection. We should also consider general patient factors such as geriatric status, severe malnutrition, obesity, active infection elsewhere in the patient and American Society of Anesthesiologist pre-op score (ASA score) when assessing our patients for risk of SSI. 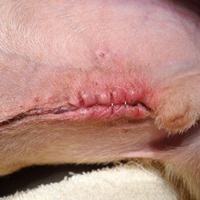 Surgical wound factors documented in the veterinary literature with increased risk of SSI, include length of general anesthesia, length of surgical time, foreign material within the wound, wound classification, and presence of devitalized tissue within the surgical field. Additionally, clipping the patient more than an hour prior to surgery and inadequate skin preparation can foster an environment conducive to higher bacterial counts at the surgical site. Formation of a seroma or hematoma at the site can provide an excellent medium for bacterial growth. Previous treatment of the surgical site with radiotherapy is associated with significant increased risk of SSI. Reduction of surgical wound infection starts with a thorough patient assessment to identify any of the factors listed above. Following through with excellent aseptic technique covering both patient and staff preparation, minimizing the number of personnel in the surgical suite, adhering to a defined pre-surgical antimicrobial protocol, effective analgesia, expeditious discharge from hospital and effective hand hygiene practiced by all staff members are part of a multimodal approach to lowering surgical wound infection. Surveillance is an important part of any infection control program and is standard of care in human medicine. The data extracted from surveillance can be used to make logical decisions regarding effectiveness of current practices, compliance with procedures and encouraging efficient and economic use of resources. A passive surveillance system, using information that is already collected in normal activities such as recheck visits, is practical and not overly labor intensive. An active surveillance program involves gathering data specifically for infection control purposes and would require considerably more dedicated time. Active surveillance begins with contacting owners at predetermined time points to acquire information about incisional abnormalities. For either passive or active programs, a single individual should be appointed as the Infection Control Practitioner (ICP). This can be a technician or a veterinarian, but should be someone with a vested interest in infection control. All SSIs would be reported to the ICP so that data can be collected regarding timing, severity, bacterial culture results, type of surgery etc. The most valuable advantage of active surveillance over passive is the ability to promptly recognize problems and potentially avert serious complications. Though impossible to completely eliminate, surgical site infection can be reduced to a minimum through a rational, hospital-wide multifaceted preventative strategy. Surveillance can pay off in measurable benefits, helping to identify problems such as breaks in surgical asepsis, inadequate perioperative care protocols, and antimicrobial resistance. Nelson LL. (2011) Surgical Site Infections in Small animal Surgery. Veterinary Clinics of North America: Small animal Practice 41, 1041-1056. Shales C. Surgical wound infection and antimicrobial prophylaxis. (2012) BSAVA manual of Canine and Feline Surgical Principles. 220-230. Weese JS. The who, what, why and how of surgical site infection surveillance. (2013) Presented at ACVS Symposium.